When the news broke in 1975 that New York City was on the brink of fiscal collapse, few believed it was possible. How could the country’s largest metropolis fail? How could the capital of the financial world go bankrupt? Yet the city was indeed billions of dollars in the red, with no way to pay back its debts. Bankers and politicians alike seized upon the situation as evidence that social liberalism, which New York famously exemplified, was unworkable. The city had to slash services, freeze wages, and fire thousands of workers, they insisted, or financial apocalypse would ensue. In this vivid account, historian Kim Phillips-Fein tells the remarkable story of the crisis that engulfed the city. With unions and ordinary citizens refusing to accept retrenchment, the budget crunch became a struggle over the soul of New York, pitting fundamentally opposing visions of the city against each other. Drawing on never-before-used archival sources and interviews with key players in the crisis, Fear City shows how the brush with bankruptcy permanently transformed New York—and reshaped ideas about government across America. 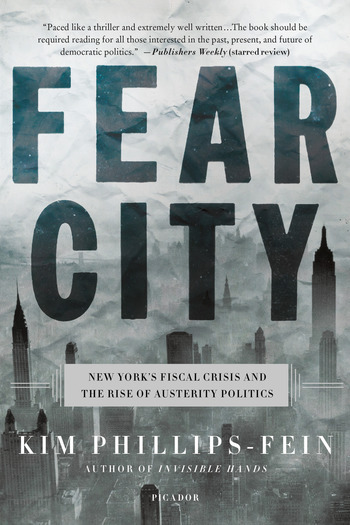 At once a sweeping history of some of the most tumultuous times in New York's past, a gripping narrative of last-minute machinations and backroom deals, and an origin story of the politics of austerity, Fear City is essential reading for anyone seeking to understand the resurgent fiscal conservatism of today. “A powerful and involving work of narrative history... You come away from Fear City with a clear sense of what was lost as New York left behind one set of priorities and embraced another.... This is a book that deserves an audience beyond New York City history buffs, and all the more so because of its relevance to our political moment. The young Donald Trump makes a brief cameo appearance as an icon of the new New York, a real estate mogul who leveraged his father’s connections and the city’s desperation into massive tax breaks, starving the city of badly needed revenues for education and other basic municipal functions as he developed properties for the rich. “The story of New York’s financial crisis in the seventies is really a story about the role of cities in America today. New Yorkers pride themselves on being cosmopolitan, on welcoming immigrants, on being willing to spend money on education, healthcare, and infrastructure. Kim Philips-Fein convincingly explains why that caused problems for the city in the past and why now we need New York values more than ever." Kim Phillips-Fein is the author of Invisible Hands: The Businessmen’s Crusade Against the New Deal. She teaches history at New York University's Gallatin School of Individualized Study, and has written for The Nation, Dissent, The Baffler, The Atlantic, and The New York Times, among other publications. She lives in New York City.